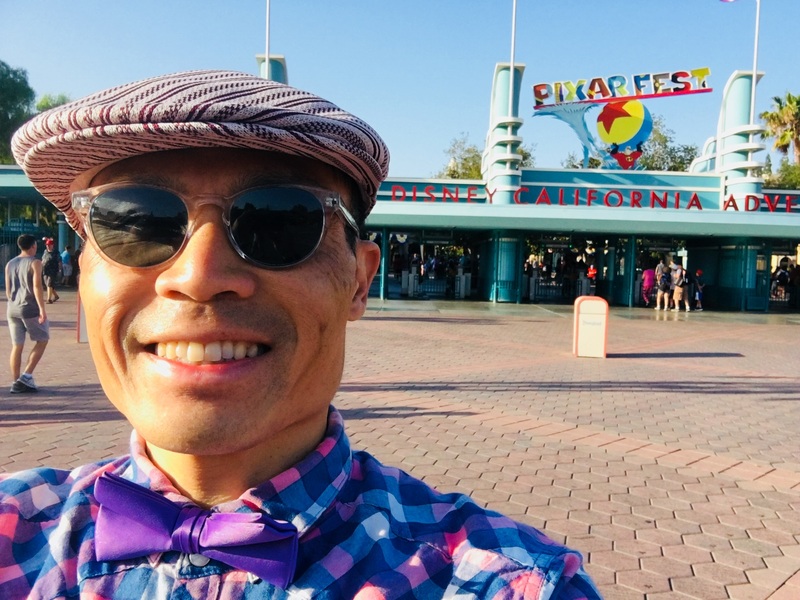 I have long thought of Disney California Adventure (DCA) as the inferior little brother to Disneyland. I grew up going to Disneyland Anaheim. It has layers and layers of history, tradition, and memories for me. That is hard to top. In contrast, California Adventure has only been around since 2001. I never thought of it as having enough attractions and destinations to justify an exclusive visit. But I had heard from others that DCA had really stepped up in recent years and offered a lot more. I loved “Tower of Terror” so much when it was introduced to DCA. The Disney Imagineers created such a cool “Twilight Zone” aesthetic around the ride that took a simple drop ride to a whole other level. So I was skeptical about how this “Guardians of the Galaxy” re-skin of “Tower of Terror” would feel. I shouldn’t have had a doubt. “Mission BREAKOUT!” is a pleasure from the queue to the final moments of the ride. I love the use of atmospheric effects, lighting, sound, set pieces, animatronics, and screens to transport you into the Guardians of the Galaxy universe. I happily rode this very popular ride twice during this visit. This is a Pixar-themed re-skin of the old “California Screamin'” roller-coaster in Paradise Pier (now called Pixar Pier.) 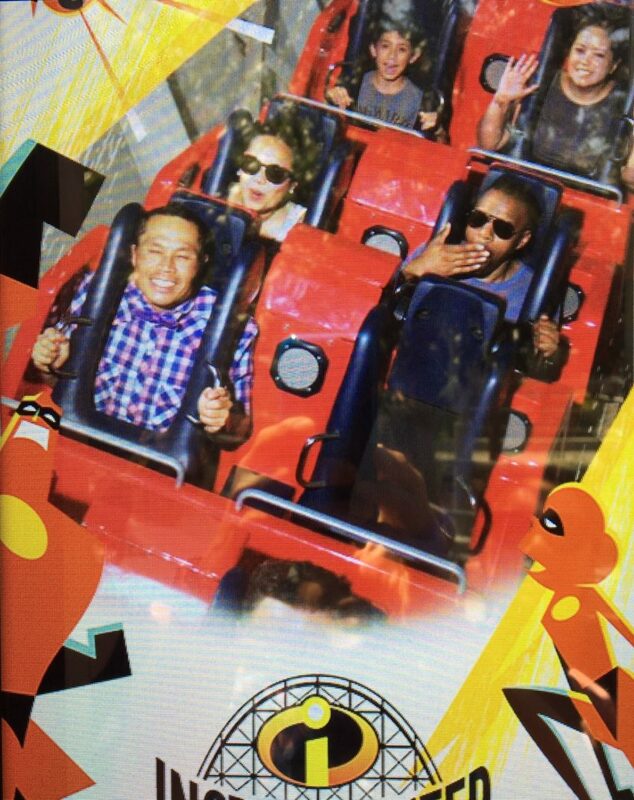 It was a super fun roller-coaster before. It’s still lots of fun, now. And the clever “Incredibles” plotline adds to the delight along the way. I love the beautiful 60’s era artwork surrounding the ride, which would look lovely as a print or a tee-shirt. I have a real soft spot for this gentle ride, that takes you to some of the most iconic sights around the planet — from the Great Wall of China to the Serengeti to the Eiffel Tower. It’s a great feeling of floating, zooming, and swaying aloft that never fails to fill me with awe. And the clever engineering of the experience means that everyone gets the best seat in the house. This is what I consider one of the most “perfect” examples of a Disney ride in the current generation of attractions. It’s got a beautiful, unique aesthetic taken from the “Cars” universe. The central idea of getting behind the wheel of a racing car in a windy mountain road is so compelling. The storyline is classic Disney, told simply but really well. And the use of animatronics to bring to life the “Cars” characters is so convincing and clever. We only went to a couple of shows, which are geared more toward very young visitors. 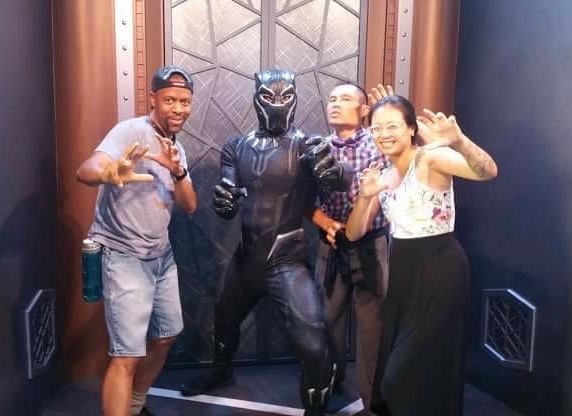 We had to experience the Black Panther meet-and-greet in Hollywood Land. It was worth it just to be near the Dora Milage royal guard, who were as badass looking as you remember from the movie. The cast members were perfectly in character — stone-faced, intimidating, but engaging. Black Panther himself was more friendly, asking each group “who was the leader of your tribe?” T’Challa had a retort at the ready when we told him that “Cap says hi.” “He is very well preserved for such an old man,” Prince T’Challa replied. “Turtle Talk with Crush” is another favorite of mine, despite being geared toward youngsters. The way that the Imagineers so convincingly have you interact with Crush is so clever and well delivered. The cast member playing Crush does such a great job at engaging children, who are just entranced the entire time. In Hollywood Land you can also view a set of Pixar Shorts in a 3D theater. It’s a welcome respite from all of the racing around the park. And I got to re-watch the very emotional “Bao” short, as well as see two more shorts that were new to me. DCA has some of the best food I’ve ever had at any of the Disney theme parks, second only to EPCOT in Florida. On this trip, I had a somewhat random assortment of meals and treats that made me quite happy. 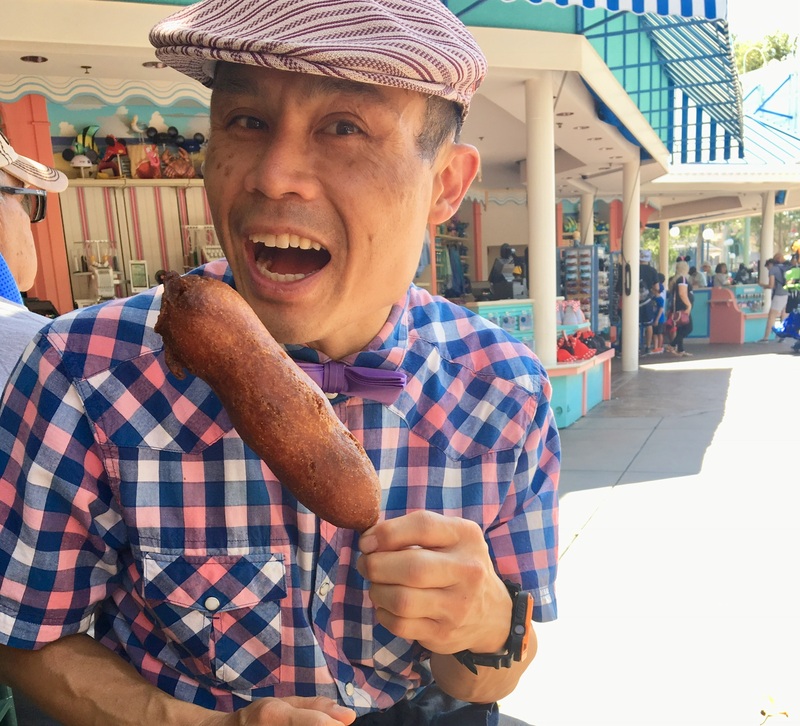 I started the day with a “Red Hot” churro from Senor Buzz Churros in Pixar Pier. 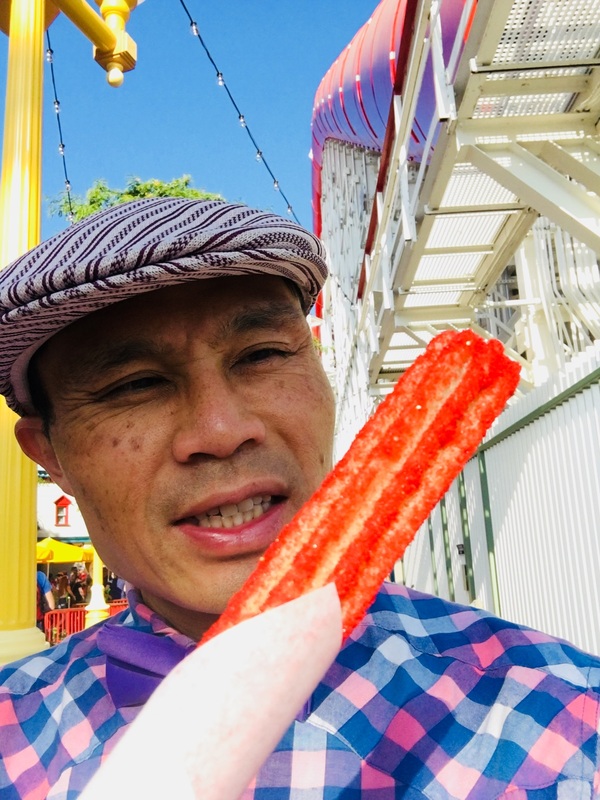 Imagine eating a churro with the flavor of a “Red Hot” candy sprinkled all over it. It was actually really tasty, even if a questionable snack at 9am. Continuing the red hot theme, I had a new variant on the much beloved corn dog at Corn Dog Castle. 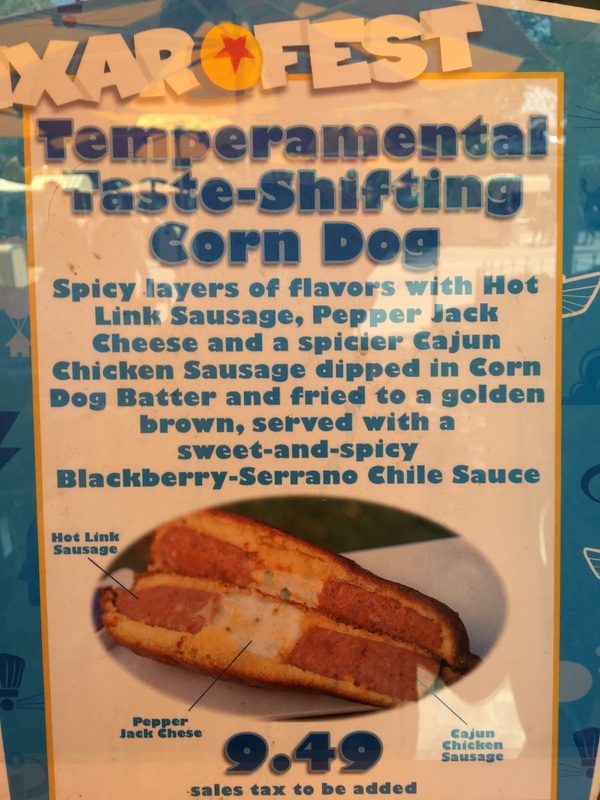 This “Tempermental Taste-shifting Corn Dog” included three different layers: a hot link sausage, pepper jack cheese, and a “spicier” Cajun chicken sausage. All of that is encased in a corn-bread batter fried golden brown, and served with a sweet-and-spicy blackberry-Serrano chile sauce. Again, sounds like possibly a poor choice for a snack, but I really enjoyed it. My main splurge meal was at the elegant Carthay Circle restaurant near the entrance to DCA. I always love the classic elegance of that place, a calm respite from the rest of the craziness of the park. Yeah, it’s spendy, but totally worth it. We ordered a basket of the popular cheese-filled biscuits to start, which was a bit much considering we also got a basket of delicious bread when we arrived. My main course was the starter portion of ceviche, which was actually perfect: a generous portion of well-marinated white fish, avocado, and tomato with plenty of crispy plantain chips. Crowds are always a thing to negotiate when you are at any of the Disney theme parks, and DCA was no exception. Because we went in the middle of the week, they weren’t particularly troublesome to me. Using a combination of the FastPass system effectively and the single rider lines meant that we rarely had to wait more than 20 minutes in any queues. I do recommend arriving right at opening if you can, to get to those big ticket attractions first. The park is in the middle of renovations and additions to the new Pixar Pier, which meant that there were rides still being built like the new carousel. There’s a bit of an unfinished feel to a lot of Pixar Pier, that should be fixed soon. Of course, I was pretty exhausted by the time the afternoon arrived. I hit a wall around 6pm that I’m sure lots of other visitors were feeling. 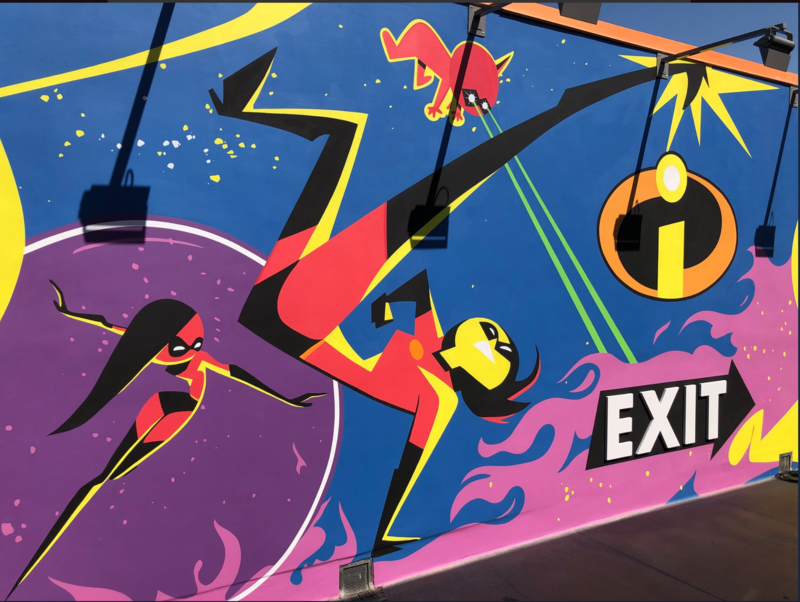 My friend and Disney park expert Lacey recommended a couple of cool spots to chill and get my energy back: the Animation Gallery in Hollywood Land and the beautiful Hotel Californian lobby right next to the park. I chose to take a break in the hotel lobby, which allowed me to power through the rest of my visit. I recommend it. More annoying was that “World of Color,” the beautiful closing light-show at DCA was closed for renovations while I was there. I was really looking forward to some kind of fireworks or light show to round out my Disney experience. Those were minor annoyances that didn’t take away from my overall enjoyment of the day. In sum, I can happily report that Disney California Adventure can more than fill a days-worth of activity. If you get a chance, I recommend the experience.